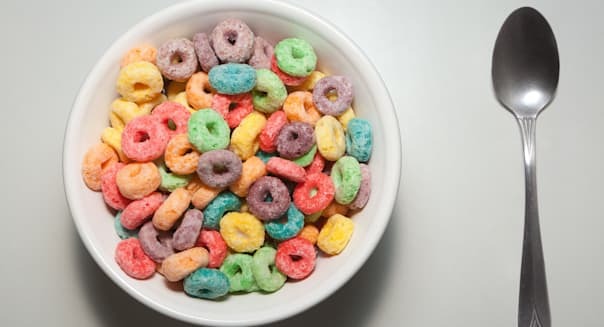 The planned takeover of smaller rival Mom Brands by breakfast cereal giant Post Holdings (POST) has mobilized a coalition fearful the merger will push up the cost of breakfast. Mom Brands makes a lot of bagged cereals that are a lot cheaper than better-known boxed cereals. Its Cocoa Dyno-Bites and Fruity Dyno-Bites are the cheap alternative to Post's Cocoa Pebbles and Fruity Pebbles. Mom Brands also sells Froot Loops knock-off Tootie Fruities and Rice Krispies cousin Crispy Rice. Losing the independence of the discount brand, the 22 "community, farm, faith, food and hunger groups" said on Wednesday, will concentrate the overall breakfast cereal market so that four companies will control 90 percent of sales. And that, they said, will likely force consumers to pay more. So, the groups are asking the Federal Trade Commission and all 50 state attorneys general to investigate the merger and its potential impact on grocery prices. "The cereal aisle is one of the least competitive places in the grocery store," said Wenonah Hauter, executive director of Food & Water Watch, one of the coalition members. "This proposed merger would join traditional brands, private label and discount brands, taking choices away from consumers, especially those who are trying to stretch their grocery dollars by shopping for discount brands." The letter was signed by Citizens Action Coalition of Indiana; Consumer Federation of America; Equal Exchange; Food & Water Watch; Food and You; Food Chain Workers Alliance; Hunger Action LA; Hunger Action Network of New York State; Institute for Agriculture and Trade Policy; Iowa Citizens for Community Improvement; Land Stewardship Project; Missouri Rural Crisis Center; National Family Farm Coalition; National Farmers Organization; National Farmers Union; National Sustainable Agriculture Coalition; Organic Farmers' Agency for Relationship Marketing; Restaurant Opportunities Center United; Rural Advancement Foundation International - USA; TakeAction Minnesota; United Church of Christ Justice and Witness Ministries; and WhyHunger. There is another side to the story, though. The deal comes at a time when breakfast cereal consumption is on the decline. Boxed cereal sales, in particular, have taken a hit, with earnings declining at Kellogg (K) and Post. Americans have increasingly turned to alternatives for breakfast. In the mid-1990s, nearly 40 percent of consumers said they started their day with a bowl of cereal. That is now below 30 percent. While overall cereal sales have fallen, bagged cereal sales have increased by nearly 6 percent over the past four years. The big question is that if Post controls Mom Brands, will the price of bagged cereals move closer to the lofty prices charged for better-known boxed brands.